Allan Thermoose’s wife is in love with a blade of grass. It’s the 375th blade directly even with the crack in the third slab of sidewalk east of the mailbox. The blade gets full sun all day, and Allan, a stickler for lawn maintenance, is careful to water it, along with all the others, for approximately thirty minutes per day, moving the sprinkler three times to ensure even water distribution. He occasionally counts the residual droplets left on the tufts of grass fifteen minutes after he shuts off the water. If he’s not happy with the results, he repeats the process until he’s positive his lawn has had enough to drink. 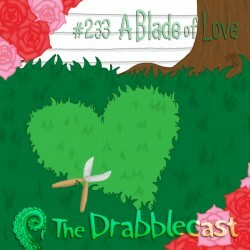 Shouldn't that be a period instead of a comma in the twabble, and why is episode 233 between 231 and 232? Nice drabble, listening to the main story at the moment. ROU Killing Time wrote: Shouldn't that be a period instead of a comma in the twabble, and why is episode 233 between 231 and 232? We're artists man, quit holding up microscopes to our art, it's suffocating! The pipeline for the Drabblecast as delivered via the new web site: Norm and the editors secure a story, I secure an artist, artist gives us art, I write a draft post for the episode on drabblecast.org (containing the art), Norm produces audio, Norm adds audio to post, and Norm publishes. There was a hiccup in this particular instance because the draft post for episode 233 is older than the published post for episode 232 (we had some number shuffling). Upon release, the ordering was weird, as you noticed. I fixed that by manually changing the date from January, when the post was made, to today. And here I was about to comment how absurd the premise of this episode is: Someone falling in love with a blade of grass. What kind of sick person could possibly get emotionally involved with the 375th blade directly even with the crack in the third slab of sidewalk east of the mailbox? ROU wrote: Shouldn't that be a period instead of a comma in the twabble, and why is episode 233 between 231 and 232? No, dammit! That's the 376th blade, people. It is such occurrences that cannot be ascribed to coincidence, which prove that human existence is a product of the illusion of free will, but in reality a scripted projection on the back of your eyelids. The fact is, ROU is having an affair with blade #375, and Bo is about to appear on a very strange episode of Cheaters. Because life, with all it's struggles, battles and obstacles usually occupies most of my day, I look to my reading and now podcast voyeurism to entertain me and most never fail in that regard. Occasionally I will run across something that exceeds the entertainment level and reaches enlightenment. This story has done that, for now I understand the wine glass and candles by my azalea bush and my wife's mysterious sleep walking. "Wash your hands and quit eating in the bathroom"
Great intro. Story was fine, somewhat ordinary plot line though. I just wanted to say that Acoustic Toothbrush is the name of my new Vampires Everywhere cover band. If I were him, I do not think I would have put up with so much crap, particularly since it was all in the claims that the grass is her new lover. I think that I would move a wide circle around it, and if she wants to spend hours trimming the rest of it with scissors, that is her prerogative. Seriously. It was pretty funny, but it also made me sad. They need to sit down and have a talk about their relationship, a talk that may very well end with them agreeing that it's time to get a divorce, and will probably include talking about seeing a psychiatrist. And when he wished that the soggy clump of leaves would love him, it seemed like he didn't really understand. Nobody claimed that the blade of grass loved her, only that she loved the blade of grass. The latter is entirely possible (though possibly a symptom of psychological issues), the former is another matter entirely. I liked the drabble better than the story, it really made me feel for those plants. I'll probably think of that one every time I mercilessly decapitate the denizens of my lawn. Regarding the Drabble, I thought it was about bunnies. I've heard about more than one incident of a nest in tall grass being mowed. When Norm mentioned grass, I was like "Whew!" tbaker2500 wrote: Regarding the Drabble, I thought it was about bunnies. I've heard about more than one incident of a nest in tall grass being mowed. When Norm mentioned grass, I was like "Whew!" Unblinking wrote: Absurd, cute, fluffy. Haha, nice parallel. But what if he demanded you perform hours of maintenance upon the PS3 every week? Her ignoring him in favor of the grass is bad enough, but she actually asks that he do a ridiculous amount of extra work to facilitate her ignoring him. It would not be easy to trim all the blades of grass except for one in particular. Trying to speak of the PS3 (I am certainly not qualified to give any non-fictional people relationship advice), but regarding the guy in the story, he really needs to talk to her about this and make it clear how he feels. If she cares how he feels, then they can try to work something out (preferably one which involves her hand-cutting that area of grass). If she doesn't care how he feels, then that in itself is not a good sign. True, she should trim her own damn patch of lawn. They are both crazy though, and perhaps they deserve each other. He did after all hear the blade’s confession of love. If not, maybe they end up hacking each other to gory bits with chainsaws and lawnmowers ….there may be a sequel in there. Christi wrote: True, she should trim her own damn patch of lawn. Don't worry. A sequel is very much in the works. It probably won't be quite as gory as you suggest, but it's certainly going to be crazy. Crazy is good enough. I can get the gore elsewhere. More of what you have already gifted will be sublime. Christi wrote: Thank you Nathaniel! Rough draft is finished. I will continue working on this one, but I like where it's going. Hopefully I can find a good venue for it. Wink, wink - Drabblecast editors. Please Uncle Norm? Pretty Pretty Please. With a tentacle on top??? Christi wrote: Please Uncle Norm? Pretty Pretty Please. With a tentacle on top??? I agree with this. I'll even add a second tentacle. On a Tuesday, the frost comes. His wife sleeps outside on top of the blade. Allan tells himself she's just doing that to keep it warm, but he can't help but feel there's something else going on. He watches all night, and he swears she thrusts a few times. And in the morning, he finds her body all limp and exhausted, and somehow she's covered in sweat despite the freezing temperature. Oh, I'd mow that SOB down, burn it, and salt the earth.